Energy efficient – Vinyl windows are made out of PVC, which provides maximum insulating benefits for your house. It retains heat during the winter and repels hot air during the summer, which puts less strain on your HVAC system to maintain comfortable indoor temperatures year-round. This could lead to significant energy savings each month. Attractive – With the right company, vinyl windows can come in various sizes, styles, and colors, and can be easily customized to suit your personal taste and complement your home. Durable – Vinyl windows are not susceptible to warping, rotting, denting, scratching, or the growth of mold and mildew, so you can count on them to last a lifetime. Cost-effective – Vinyl windows are budget-friendly, so you don’t have to spend a fortune to install top-quality windows on your home. If you are searching for a company to provide you with vinyl replacement windows that you will love, turn to the professionals at ABC Seamless Home Specialists. 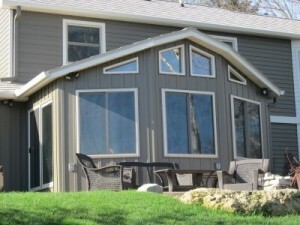 We are a trusted home improvement contractor that is highly regarded among discerning homeowners in the Madison, WI, area. In fact, we maintain an A+ rating with the Better Business Bureau as evidence of our stellar workmanship and the satisfaction of our customers. Contact ABC Seamless Home Specialists for more information about the exceptional vinyl replacement windows we offer to homeowners in the Madison, WI, area.